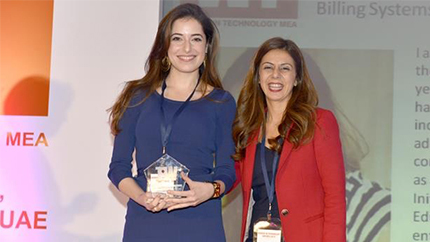 Shaden Mar’I (Jordan), Nassima Berrayah (Algeria), and Abeer Dawood Abu Ghaith (Palestinian Territories) are winners of the Inaugural Women in Technology Awards. Presented in seven categories, the three exchange alumnae won Best Mid-Level Technology Executive, Best Technology Business Start-Up, and Best Technology Enabler and Facilitator, respectively. With 43 women on the short list for awards, and 12 alumnae of U.S. government exchange programs among them, we are delighted that more than a quarter of this year’s award nominees are exchange alumnae. Of the twelve women nominated for awards, eleven were alumnae of the TechWomen program, which empowers the next generation of women leaders in the technology field by bringing together women in Northern California with their counterparts in the Middle East, North Africa, and sub-Saharan Africa for a professional mentorship and exchange program at leading technology companies. Bih Janet Shufor Fofang (Cameroon), a TechWomen alumna, spoke at the ceremony And Abeer Dawood Abu-Ghaith, an alumna of the International Visitor Leadership Program, won the award for Best Technology Enabler and Facilitator.